Lexmark XS736de Laser Multifunctional Printer w/ Extra Paper Tray & Storage Cart . New Life Scientific, Inc. This printer is in great working condition, prints and copies as it should. This multifunction printer does fax, copier, printer and scanner. The digital 7” Touch Screen is in excellent condition with a bright display. 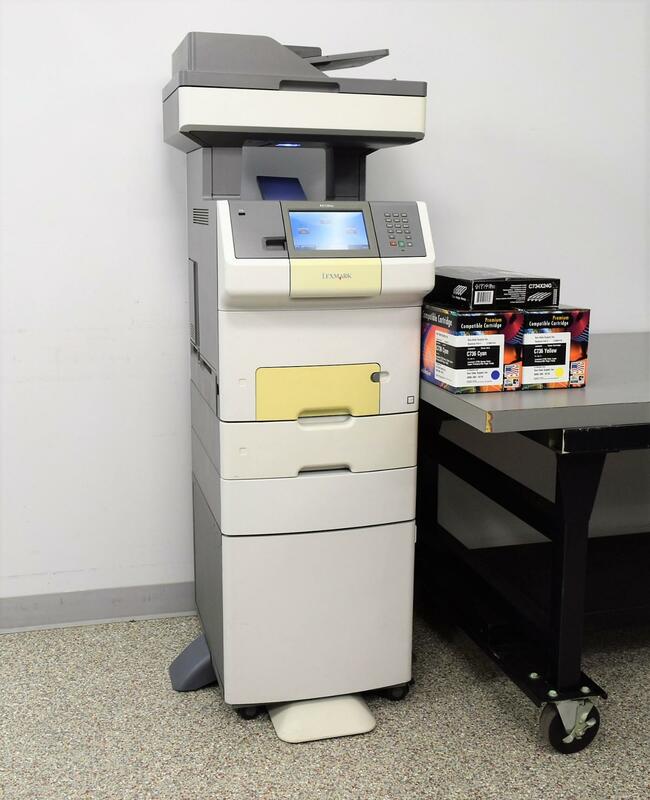 This beauty can copy/print up to 35 ppm B&W or Color; documents can be enlarged up to 400% or reduced to 25% with a printing resolution of 1200 x 1200. With a whopping 6,000 pages per ink cartridge. Our technician confirms that the printer hums right along. The only issue is when printing or copying there is a grey shadow on the background of the paper. I have included a photo of this in the gallery pictures. This is due to it needing a new transfer belt which is in the Transfer Module Maintenance Kit (40X6401) that can be ordered from Lexmark or Ebay has them.